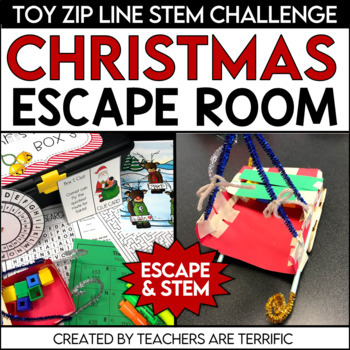 This resource is the perfect way to keep students engaged and learning during the busy holiday season. This unlock the box event will keep kids busy solving math problems, plotting a path through a maze, and completing a word search puzzle. They will have such fun and practice skills at the same time! An Escape room is a puzzle game in which students solve riddles and puzzles and find clues to finish tasks. In this Quest students solve puzzles to open locked boxes. NOTE: This Escape Room resource is available in a money-saving bundle! For all three tasks students will use a Letter Wheel and its code to solve a puzzle. The code changes for each task. • For the first task, students solve math problems. • For the second task, students will find the correct path through a maze and collect letters that are crossed on the correct path. • For the third task, students complete a word search and the unused letters on the grid will spell a clue. For all three of these tasks, students use the initial clue they find to search for a second clue. That second clue gives them the code to use on the Letter Wheel which will solve another puzzle. All of this leads to unlocking a box to receive the next task. Don't worry - the teacher's guide includes a photo sequence of how the puzzles are solved- as well as step-by-step directions for preparation. So, what do you need? You will need three number locks for this quest. Directions are included to use this set without these locks! You will also need three boxes. This can be a plastic or metal tool box, but any box will work- even a cardboard box! Directions and photos are included for how to set up the boxes and locks or how to use a version without locks. You do not need 3 boxes and 3 locks per group! It’s three boxes and three locks for the entire class. Included in the Escape Room file of this resource, you will find: a table of contents, and 3 pages of tips and tricks for setting up everything. 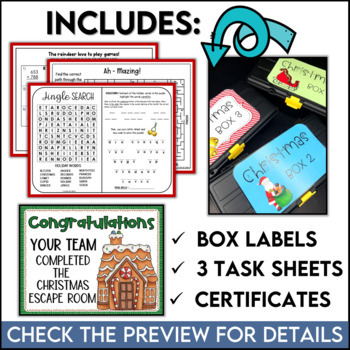 For Box 1- 2 pages of teacher directions, math sheet in two ability levels, Letter Wheel template, Reindeer poster, answer key, and the box labels. For Box 2- 2 pages of teacher directions, maze in two sizes, letter wheel puzzle, answer key, and box labels. For Box 3 – 2 pages of teacher directions, word search puzzle in two sizes, letter wheel puzzle, answer key, and box labels. 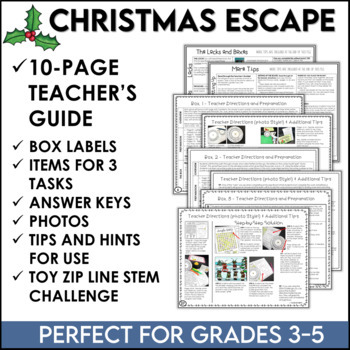 In addition: hint cards for each task, an alternative locking system (made of paper), STEM Challenge information section, certificates to award students completing the task, one extra Christmas poster (just for fun), black and white versions of all posters and pages provided in color. File 2 contains the STEM Challenge! The challenge is to build a sleigh that will carry toys down a zip line. This is a STEM Quick Challenge that can be set up and used in a short amount of time (45 minutes for the activity). 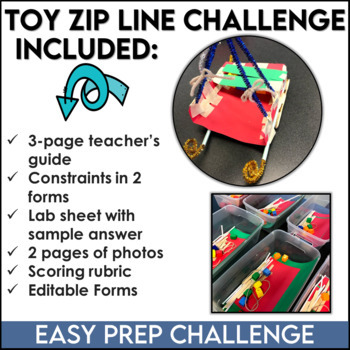 The STEM Challenge file specifically contains an overview page, 3 pages of teacher’s directions, constraints in 2 forms, lab sheet with sample answer, 2 pages of photos, and a scoring rubric. The forms for this challenge are editable. Check the preview to see everything! One more thing to note: The Escape Room event can be completed in 30-45 minutes. The addition of the STEM Challenges will add an extra class session of at least 45 minutes. All you have to do is follow my store. Look for the green star next to my store logo and click it to become a follower. It’s that easy to receive email updates about Teachers are Terrific!